Planning an event can be quite exciting at first. But it’s also quite overwhelming once you start. Choosing a banquet hall is often the most crucial consideration in event planning. A seasoned event planner often starts with booking the right location and size for a banquet hall in Dubai. But if you’re just starting out, what’s the right size? What’s the right size of a banquet hall? To begin with, there’s no perfect size for a banquet hall. No single golden rule to adhere to. It all depends on the nature and size of your event. Will you be expecting a lot of people? Is your event big or small? Is it formal or informal? If your event is formal, you might want a bigger banquet hall. But if you are just inviting over a few friends and family, you’d probably want a cozier place to catch up. Another good idea is to consult your guest list. A bigger party obviously requires a bigger square space. You don’t want your guests to leave because there wasn’t space for them. You also don’t want them to be uncomfortable or feeling crammed. The right size also depends on the nature of your event. Is it a sit-down dinner or a stand-up cocktail reception? When you’re offering dinner, you would require more space to accommodate the banquet tables. Also, if you’re conducting a corporate workshop or training event that requires your attendees and participants to move around, then it’s wise to have a workspace that’s adequate in size. On an average basis, each of your guests will require space of 8 square feet (remember personal space?). However, if it’s a sit-down dinner, you would have to give each guest 10-14 square feet to accommodate the tables and chairs. Multiply this by your number of expected guests and you’ll get a rough idea of your size. Also, determine what you’re offering at your event. What are the extras? Do you require a stage or a dance floor? For that, you’ll have to shell out some extra space. Why is the right size so important? The perfect banquet hall or event space accommodates just the right number of guests. A banquet hall that’s too small or too big might make your guests uncomfortable. If you book a small banquet hall for a large group, it will feel crowded quickly. And now imagine that the air conditioner has a technical problem and the sweating starts. They’ll probably leave earlier than planned. Since you probably want your guests to leave your event smiling and happy, a crowded banquet hall isn’t a smart choice. On the flip side, the rule of the bigger the better doesn’t necessarily apply here. Amateur event planners are often tempted to book bigger banquet halls. Bigger banquet halls create negative spaces and it gives the impression that guests are missing. Some of your guests might even go home saying the event wasn’t a success because not many people turned up. 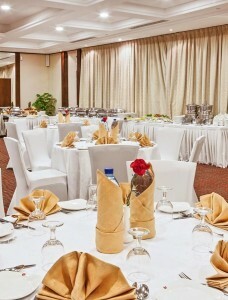 The bigger banquet hall also makes it difficult for the guests to communicate. The first few attendees often choose to sit in empty spaces. As more guests come in, the distance between these empty spaces is quickly taken up. If your banquet hall is too big, these empty spaces never fill up and there’s just too much distance between the attendees. This creates a communication gap. If it’s a training event, you might be disappointed to see your guests engrossed in their own mini-events. If you would like to discuss the right banquet size for your event, you are welcome to talk to our experienced event managers. Visit www.fluidmeet.com to learn more. 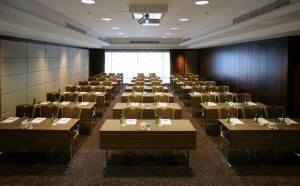 Previous PostWhat’s the difference between a banquet hall, meeting room, and event space? Next PostWhat kind of food should be served at my event?